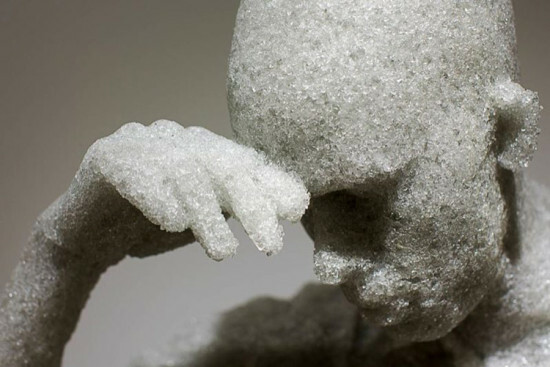 Remember the Future: Daniel Arsham Contemporary Arts Center 44 East 6th Street Cincinnati, OH March 20–August 30 Remember the Future is the first major exhibition in Ohio by Cleveland-born artist Daniel Arsham. 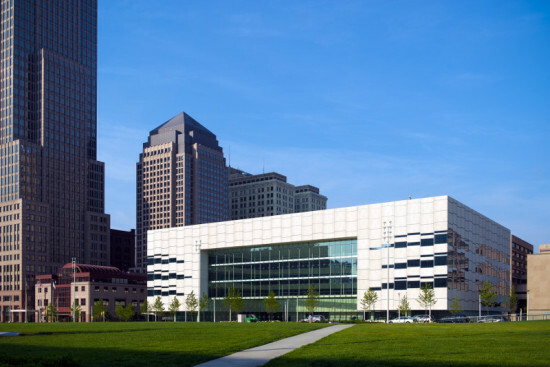 In it, site-specific installations respond to the scale, light, and structure of the Contemporary Arts Center building in Cincinnati. Known for “making architecture do all the things it shouldn’t,” Arsham’s work marries theater, classicism, and hallucination by liquefying gallery walls, furniture, and the human form. Eerie, cloth-covered figures ripple from the walls as if trying to entice the viewer to another world on the far side, while elsewhere Arsham makes the walls appear to be in the process of melting. 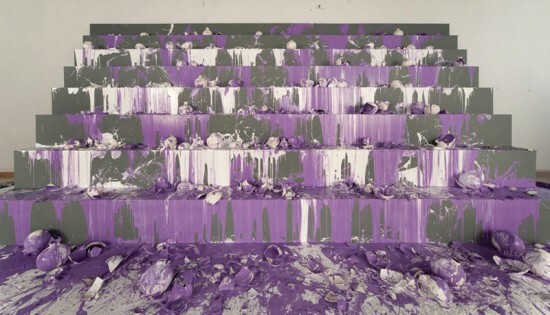 The artist’s recent work has involved casting outdated media devices—cameras, film projectors, and microphones—in geological material such as volcanic ash, crystal, and crushed glass. The Cleveland neighborhoods of Kinsman, Duck Island, and West 65th Street could eventually get major updates now that three new plans have won unanimous approval from the city’s planning commission. All three neighborhoods were built when Cleveland’s industrial heyday propelled a boom of real estate development that has long since given way to depopulation. In Kinsman, on the city’s far East Side, the plan proposed creating an arts and entertainment district. 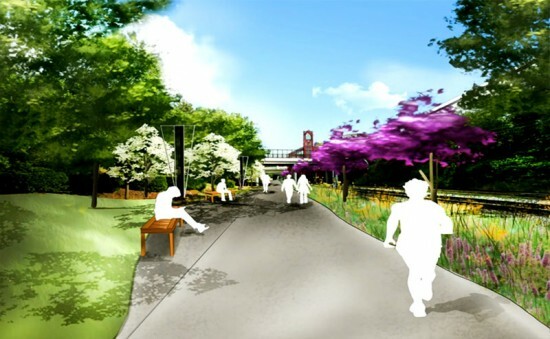 The Duck Island plan focused on multi-modal transportation hubs, and the plan focusing on the West 65th Street neighborhood called for a two-mile multi-purpose trail. 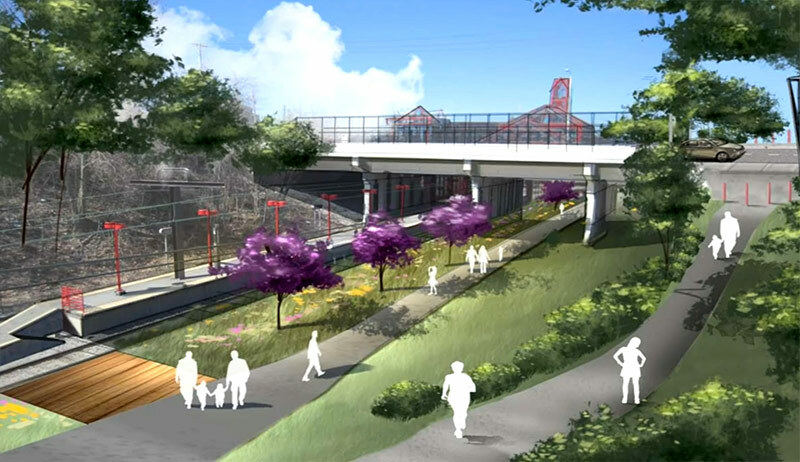 Funding for most of the work is still undetermined, but the city has committed some money for bike lanes, curb extensions, and other local improvements already called for in the three plans. Cleveland’s conflicting development pressures came to a head last week over one avenue on the city’s West Side, and whether its future holds car-oriented businesses like McDonald’s or lanes for public transit and bike paths. 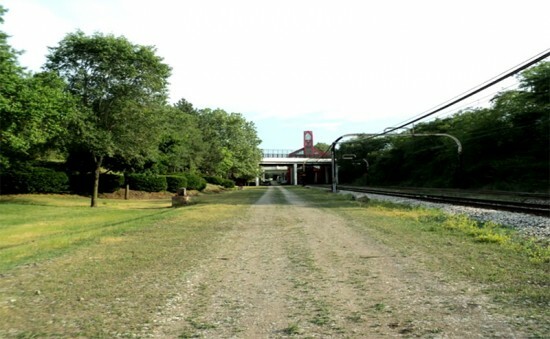 The Plain Dealer's Steven Litt reported on developers’ plans to suburbanize the area around Lorain Avenue at Fulton Road: “Residents hate the idea with a passion,” he wrote. Much of Cleveland was designed when its population was far greater than it is today. Though on the rebound, the city has far different needs than it did in decades prior. That’s the thinking behind the Ohio City Inc. community development corporation’s new plan, which calls for a $17.3 million overhaul of the avenue from West 25th to West 85th streets. The route would include a 2.3-mile, bicycle track along the north side of the street—the city’s first separated, two-way paths for bikes. Proponents of the plan and those who’d prefer automobile-oriented development could have it out at an upcoming community meeting in January in the Detroit Shoreway neighborhood (time and place to be announced). The City Planning Commission could pick it up from there. Cleveland’s Ohio City neighborhood has enjoyed a renaissance in recent years, and recently reexamined transportation policies to build on the increasingly urban character of this self-described artisan neighborhood. 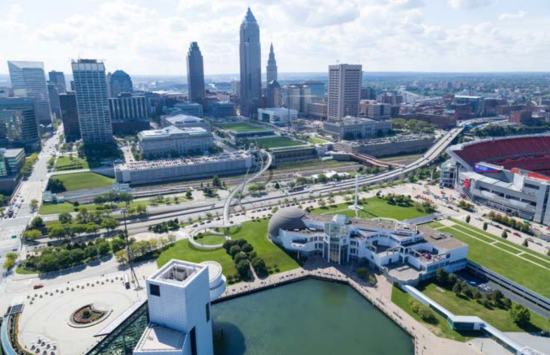 The Northeast Ohio Sustainable Communities Consortium is striking back against a wide-ranging problem that has scarred few regions more than this corner of the Midwest: sprawl. The non-profit is a collaboration between city, county, and regional government entities, as well as private foundations and academic institutions. It is funded by a $4.25 million grant from the federal Department of Housing and Urban Development, along with $2.4 million in local matching funds. As part of its final push in a three-year effort to chart a sustainable future for Northeast Ohio, the voluntary group has convened a series of public forums to persuade roughly 400 municipal entities in the 12-county area to reverse course before business-as-usual development trends further burdens the regional economy. New infrastructure to accommodate more suburban development would leave the region as a whole with a 33.7 percent gap between revenues and expenses, the Consortium estimates, if people continue to move away. 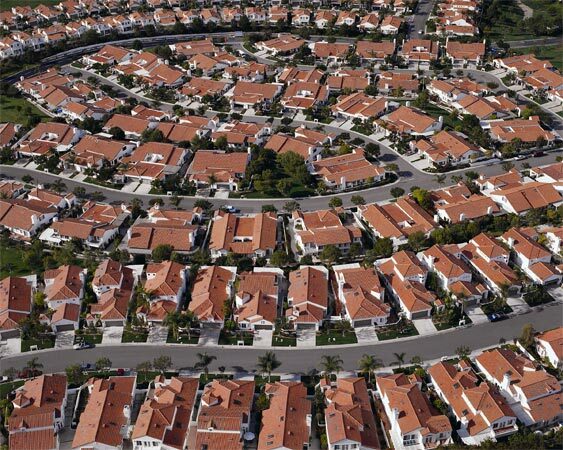 If population loss is less severe, that gap could shrink to only 6.4 percent, but in that case local developers would need to sacrifice nearly 50,000 acres for suburban development. 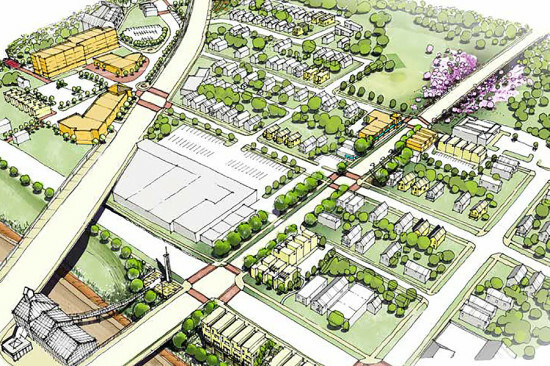 The Cleveland Plain Dealer reports on the Consortium’s third way: A third scenario, labeled “Do Things Differently,” assumes that the region consumes only 4,100 acres of land through additional suburban development, but builds 2.5 times the amount of new urban housing than under the “Trend” or “Business as Usual” scenario. “Do Things Differently” also assumes that 20 percent more jobs would be located near transit than if current trends are allowed to continue. The result: a 10.4 percent surplus in local government budgets. 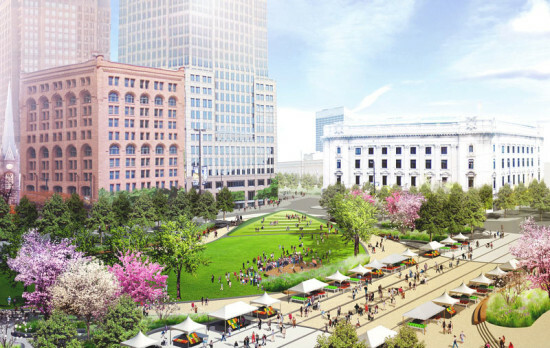 Cleveland has made a push for high-density development and urban renewal, including recent developments around Cuyahoga County’s new $465 million convention center. But as Northeast Ohio attempts to escape its past, regional initiatives could play an increasingly important role. 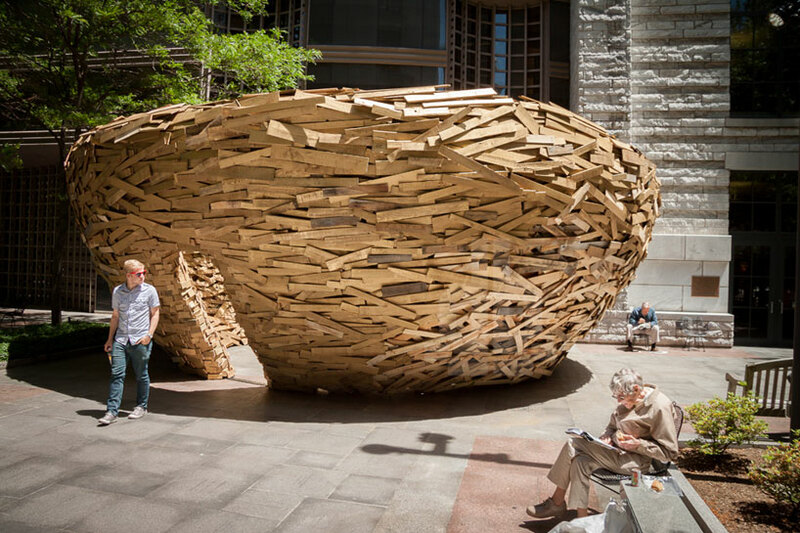 If you drop by the Cleveland Public Library to get lost in a book, you may find reprieve from modern life outside the library’s walls, thanks to a giant reading nest custom designed by New York artist Mark Reigelman and LAND Studio. 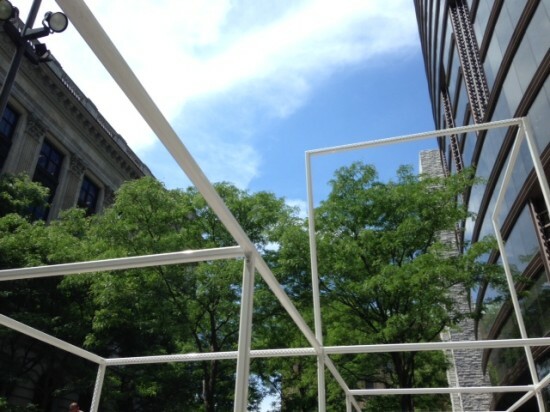 The installation is the fourth in a series, called "See Also," which brings public art to the library's Eastman Reading Garden. It will be in place through October 18. The whirlwind of 10,000 palette boards and two-by-fours comprise a roost 13 feet tall and 36 feet across, reinforced with steel cable. Made from reclaimed wood from industrial sites in the Cleveland area, the nest creates an intimate, sheltered environment for reading or for staring at the perfectly framed sky. 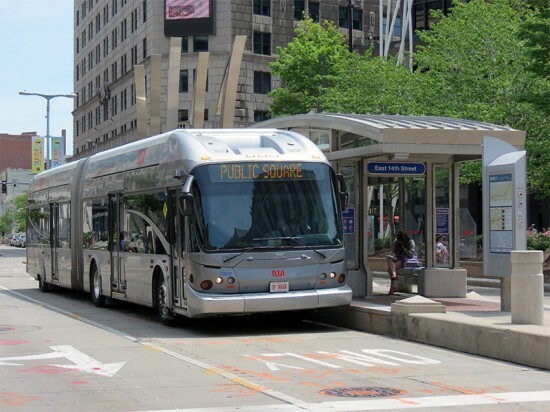 Cleveland was the only U.S. city to earn a “Silver Standard” ranking from the Institute for Transportation & Development Policy (ITDP) in its second annual bus rapid transit corridor rankings. 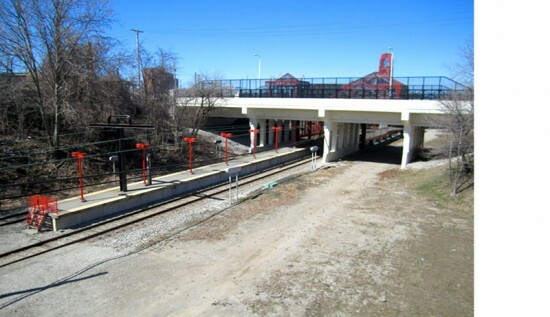 Cleveland’s HealthLine, formerly The Euclid Corridor, is a 9.2 mile transit corridor connecting Downtown, University Circle, and East Cleveland with 40 stops along the way. Hybrid articulated buses ferry passengers 24-7, and have brought billions of dollars of investment to the city’s key economic centers. Guangzhou, China topped the “Gold Standard” list, with Latin American cities (Bogotá, Curitiba, Rio de Janeiro, Lima, Guadalajara, and Medellin) monopolizing the rest of those rankings. Some North American cities made the “Bronze Standard” list: Los Angeles; Eugene, OR; Pittsburgh; Las Vegas; and Ottawa.